We talked about the influx of Korean monitors into the market when we reviewed the QNIX QX2710 LED display back in April last year. This manufacturer, along with other common vendors like Achieva and Yamakasi for instance focus on providing low-cost displays, built around decent quality panels. We tested a 27" model from QNIX last time, and now we have a 32" sized model with us now, the "QX320QHD Super Ultra DP Lite". There are a few variations of this screen available, with the functionality of the stand and the video inputs being the main differences it seems. The panel used and the spec and performance is the same. The model we have with us now is the more basic of the stands, with only a side to side swivel adjustment offered. It has DVI, HDMI and DisplayPort inputs. Look out for the "QX320QHD Super Ultra Pivot" model as well which has a more functional stand with tilt, height, swivel and rotate offered. There are versions with the adjustable stand but without the DisplayPort input as well. The QX320QHD (as we will refer to it as throughout the review for ease) uses a 2560 x 1440 resolution AU Optronics AMVA panel, the same as used in the BenQ BL3200PT in fact. This model supports virtual 4k resolutions as well (3840 x 2160 resolution) through the AD board inside the monitor. There is also a low blue light mode and flicker free backlight promoted, much like BenQ's own recent developments. The features list even mentions that the screen can be overclocked although the actual performance we have seen can vary so we are keen to see how this one performs. We will test all these features throughout the course of this review to check if they deliver. The QX320QHD model we have with us offers a reasonable range of modern connectivity options. There are HDMI, DisplayPort and Dual-link DVI input interfaces provided for video connections. There is no D-sub offered here. All the interfaces can support the native 2560 x 1440 resolution at normal 60Hz refresh rate. Only a DL-DVI cable is provided in the box, no HDMI or DisplayPort. Some versions of the QX320QHD come without the DisplayPort interface, and some have a second HDMI port as well so check the specs. The screen has an external power supply which is provided in the box alongside the power cable. There are a few extra features from this screen as well including integrated 2x 5W stereo speakers, support for 'Virtual 4k' resolutions and a low blue light mode. There are no USB ports offered on this model or features like ambient light sensors or motion sensors. The QX320QHD comes in an all black design. Glossy plastics are used for the bezel which has a "QX320QHD" logo in the top left hand corner, and a "QNIX" logo in the middle of the bottom bezel. The bezel measures a modest 16mm along the sides and top, and 22mm along the bottom edge. There is a fairly large power LED in the bottom right hand corner which glows blue during normal operation and red when the screen is on standby. On this model we have with us (Super Ultra DP Lite) the stand is screwed in to the back of the screen and connects in to a large black glass base. This measures 320 x 180mm in size and provides a strong base for the screen. Because the screen is so large, and the arm quite thin, the screen does wobble a bit from side to side however. The back of the screen is matte black plastic as shown below. There are VESA 200 x 100 screws on the back, and the interface connections are located on the bottom edge of that central section. The stand screws in to the bottom of the display at the back as well. The versions we have with us has a very limited stand indeed. The only function it provides is a side to side swivel, which is at least smooth and easy to use. There is no tilt adjustment which is our main gripe, as the screen is too vertical and needs to be tilted back a bit. We actually ended up wedging something under the bottom of the stand at the front to tilt it back a bit for our use. There is no height adjustment either which makes this stand very limited. There are versions of the QX320QHD with a fully adjustable stand (including pivot as well) so we would certainly recommend those where possible unless you plan to wall/arm mount the screen. It is at least VESA compliant. The materials were of a reasonable standard and the build quality felt ok, although fairly no frills as you might expect. There was no audible noise from the screen, even when conducting specific tests which can often identify buzzing issues. The whole screen remained fairly cool even during prolonged use as well which was pleasing. The back of the screen provides connections for the power supply which is provided with the screen. There are then video connections for DisplayPort, Dual-link DVI and HDMI. Additional audio in/out ports are also provided. The screen is controlled through a series of 5 buttons located on the bottom right hand edge of the screen. There are a few quick access options available. The 'EYE' button turns the low blue light mode on and off. The 'G' button accesses the preset game mode quickly. The source button allows you to switch between the various inputs. This is actually quite a slow and cumbersome process and it takes a while to cycle to the one you want (if you have more than one device connected). You have to cycle through them in order each time as well to get to the one you want. The down/volume arrow gives you quick access to the volume control as shown above, if you're using the built in speakers or headphone jack. The 4:3/up arrow switches between the two aspect ratio modes, wide and 4:3. The "menu" button brings up the main OSD as shown above. This is split into 7 sections, although two are greyed out here as they relate to the analogue input only and we are using DVI. The "bright / Cont" section gives you control over the brightness and contrast settings as you would expect. The "color settings" menu gives you access to the colour preset modes and the user configurable mode, useful for calibration. The "OSD" section allows you to adjust the behaviour of the menu itself. The "language" section is self explanatory. 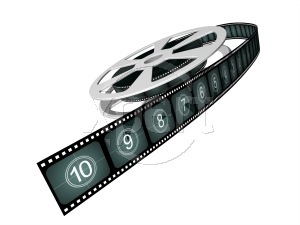 The "misc" section contains the aspect ratio control and DCR function. The 'user mode' option switches between the normal and game preset modes. The 'initialize' setting does a factory restore of the screen. All in all there were not many options or settings in the menu to play with. We would have liked to have seen better preset mode availability and perhaps certain settings defined for different uses beyond just gaming. There is also no control over the overdrive impulse so we will have to hope the manufacturer has set this up appropriately. We did find navigation a little tricky in some cases and it wasn't as intuitive as it could have been. We found we sometimes switched the screen off accidentally via the power button which is located a little below the "down" arrow. Because the stand is fairly unstable the screen wobbles a lot when you use the buttons on the bottom edge, so it didn't feel very sturdy. One last minor gripe is if you reset the screen using the initialize option, the default language returns to Korean, so you have to find the language section and turn it back to English. In terms of power consumption the manufacturer lists usage of 50.0W and 0.5W in standby. We carried out our normal tests to establish its power consumption ourselves. We tested this ourselves and found that out of the box the screen used 54.4W of power. 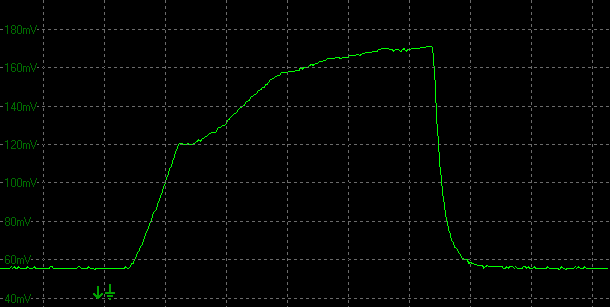 No matter what brightness setting you select in the OSD menu, the power consumption barely changes at all. There is a reason for this which we will discuss later on in the review but because of the way this brightness control works, you are stuck using the full power consumption at all times. This should probably be a consideration as it's much higher than most displays once calibrated to a comfortable luminance. Even when the screen is on standby it uses 7.1W of power, nowhere near the spec of 0.5W. 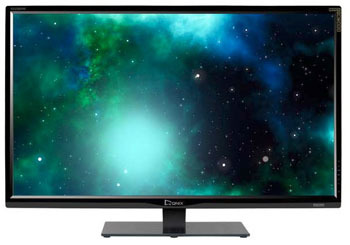 The QNIX QX320QHD features an AU Optronics M320DVN01.0 AMVA panel which is capable of producing 16.7 million colours. The panel offers an 8-bit colour depth and the part is confirmed when dismantling the screen as shown below. This is the same panel as used in the BenQ BL3200PT as well. Most places, including the QNIX spec seem to refer to this screen as having an "AH-VA panel" which is in fact incorrect. AHVA is AU Optronics' answer to IPS technology from LG.Display. The panel used here is an AMVA (VA type) panel as indicated by the high contrast ratio of 3000:1 - which is a dead giveaway that it is VA and not IPS-type. The screen coating on the QX320QHD is a light anti-glare (AG) offering as opposed to any kind of glossy coating, similar to other AMVA panels we've tested in the past although perhaps not quite as "semi-glossy" as we're used to. It retains its anti-glare properties to avoid unwanted reflections, but does not produce an overly grainy or dirty image that some thicker AG coatings can. There are some slight cross-hatching patterns visible if you know how to spot them but they are very subtle and shouldn't bother the average user at all. Certainly not as pronounced as seen on the Dell U2713HM which was sometimes criticised for the cross-hatching appearance of the coating. The screen uses a White-LED (W-LED) backlight unit which has become very popular in today's market. This helps reduce power consumption compared with older CCFL backlight units and brings about some environmental benefits as well. The W-LED unit offers a standard colour gamut which is approximately equal to the sRGB colour space (100% sRGB coverage quoted). Anyone wanting to work with wider colour spaces would need to consider wide gamut CCFL screens or the newer range of GB-r-LED type displays available now. If you want to read more about colour spaces and gamut then please have a read of our detailed article. At all brightness settings a constant voltage is applied to the backlight, and PWM is not used for backlight dimming at all. There is a low amplitude and low frequency (60Hz) oscillation evident in the graphs above, but it's not something which should cause any real issue in practice. The screen is flicker free as a result. However, the bad news is that when you alter the brightness control you are actually controlling the digital white level, and not adjusting the backlight voltage (using a Direct Current method). 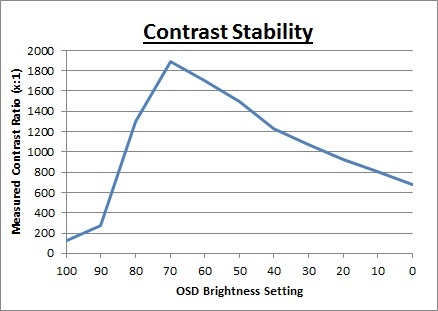 As a result, contrast ratio is destroyed and it is hard to achieve a satisfactory setup. See the following sections for more information. The screen does live up to its flicker free advertisement, but the brightness control method used is not very good. The brightness control gave us a pretty good range of adjustment when it comes to actual luminance output. At the top end the maximum luminance reached 264.4 cd/m2 which was high, and only slightly lower than the specified maximum brightness of 300 cd/m2 from the manufacturer. There was a decent 182.59 cd/m2 adjustment range in total, and so at the minimum setting you could reach down to a fairly low luminance of 81.81 cd/m2. This should be adequate for those wanting to work in darkened room conditions with low ambient light. A setting of 25 in the OSD menu should return you a luminance of around 120 cd/m2 at default settings. We have plotted the luminance trend on the graph above. The brightness setting in the OSD menu does reduce the luminance of the screen in a fairly consistent manner, although the adjustments at the top end from 100 - 90 don't alter the luminance much. It is when we examine the contrast stability information that the truth emerges about the brightness control of this screen. While it is good news that the screen is dimmed without the need for Pulse Width Modulation, and is flicker free, a more problematic issue arises here. 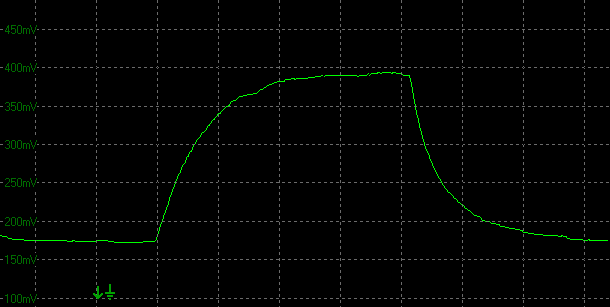 The backlight intensity is not actually being adjusted at all here, and it is always running at maximum voltage, and therefore a constant (high) power consumption. To avoid the need for PWM to dim the backlight, QNIX have instead opted to use a digital white level control. That means that the brightness control is controlling the digital white level, having a massive knock-on effect to the contrast ratio and the appearance of the image. You can see that the contrast ratio varies hugely across, and you can see this in practice as the contrast and image look very varied across the brightness adjustment range. In the best case, at around 70% brightness we achieve a contrast ratio of 1888:1 which is very good obviously, although nowhere near the advertised 3000:1 spec. At this brightness setting you have a specific digital white level setting, paired with a specific digital lack level setting from the 'contrast' control option. The resulting contrast and image at least look right, but as you move away from this balance of the two, the actual contrast ratio is affected significantly. Unfortunately at settings around 70% brightness where the contrast ratio is at least good, the luminance is too high for comfortable viewing at around 208 cd/m2. If you want to achieve a comfortable luminance of around 120 cd/m2 a setting of about 25% brightness is needed in the OSD menu, which leaves you with a contrast ratio of ~990:1. Not only are you crushing contrast ratio, but dark content detail is totally lost as well and the image does not look as good. This is a very rare thing to see in the modern desktop monitor market, and frankly is very disappointing. 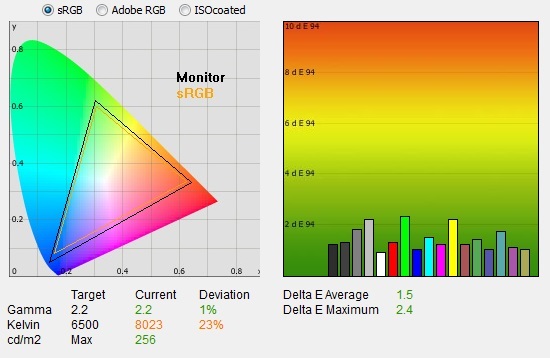 The brightness control should be controlling the backlight intensity, allowing you to achieve a good range of luminance while maintaining a stable contrast ratio as well. As a result the only way to get a more comfortable brightness from the display is to change the monitors digital white level, or change your graphics card brightness output. Either way, you are crushing the contrast ratio significantly and affecting your image quality negatively. 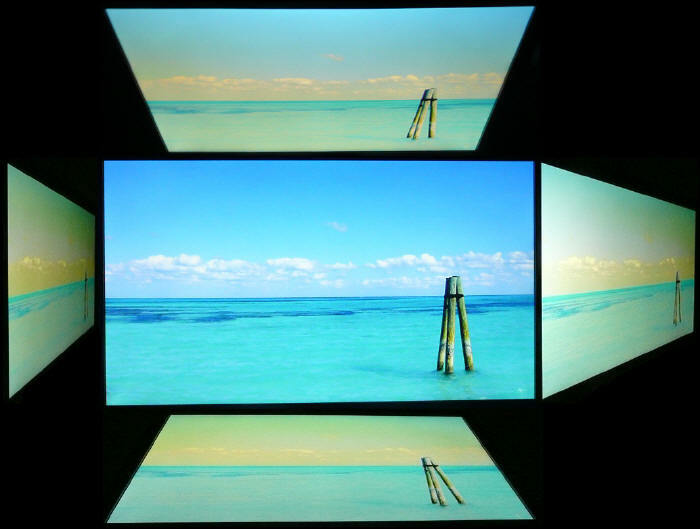 Initially out of the box the screen was set in the default 'normal' preset mode. The screen was bright as it was set at a default 80% brightness setting. Colours felt a bit too cool, but you could tell it was a standard gamut screen. We went ahead and measured the default state with the i1 Pro. The CIE diagram on the left of the image confirms that the monitors colour gamut (black triangle) is roughly equal to the sRGB colour space. There is some minor over-coverage in some blue and green shades, but not by anything significant. 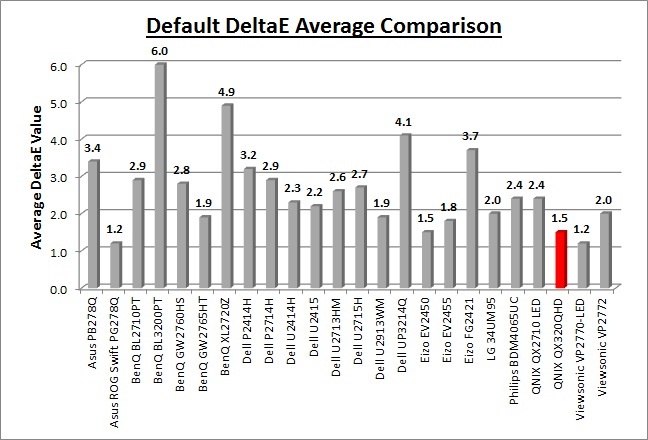 Default gamma was recorded at 2.2 average, leaving it with a small 1% deviance from the target of 2.2 which was very good. White point was measured at 8023k being too cool and 23% out from the target of 6500k which was a shame. Perhaps this was a deliberate overly cool normal mode, so that it's visibly easy to tell when you switch to the heavily promoted low blue light mode which is warmer? Luminance was recorded at a bright 256 cd/m2 which is too high for prolonged general use. The screen was set at a default 80% brightness in the OSD menu but that is easy to change of course to reach a more comfortable setting. The problem with doing that is that it massively impacts the contrast ratio and appearance of the screen since you are not adjusting the backlight intensity, but adjusting the digital white level. We have talked about that in the previous section and will look at how to calibrate the screen in the following section. At this default setting the black depth was 0.18 cd/m2 giving us a good static contrast ratio of 1460:1. This was strong compared with other panel technologies like TN Film and IPS, but for a VA panel it was pretty low. It couldn't live up to the specified 3000:1 figure and because of the way the brightness control works, it really varies massively depending on your brightness setting. Colour accuracy was at least very good out of the box with a default dE average of 1.5 and a maximum of only 2.4. Testing the screen with various gradients showed smooth transitions with no sign of any banding thankfully. There was some gradation evident as you will see from most monitors in darker tones. You will note that we've also listed the RGB levels for each of these preset modes in the table above. These are locked for each preset, with the exception of the "user" mode where you can change them as you like. We had found on the 27" QX2710 that the preset modes didn't offer any real adjustment at all to the RGB levels, and so the resulting white point remained very static. On the QX320QHD the preset modes do at least change the appearance. The normal mode is a bit too cool as we'd established in the previous section of the review. The 'reddish' mode was actually closer to our desired 6500k white point, measured at 6585k here. Bluish was much cooler even than the normal mode. Low blue light mode did indeed reduce the blue gain a lot, resulting in a warmer appearance and a 5814k white point. The user mode was incredibly yellow by default and was warmer still. We're not sure why the user mode is set up by default like this, but at least you can change the RGB settings in that mode for calibration. The Low Blue Light mode designed to reduce the blue spectral output of the W-LED backlight which can be harsh on the eyes to some users. 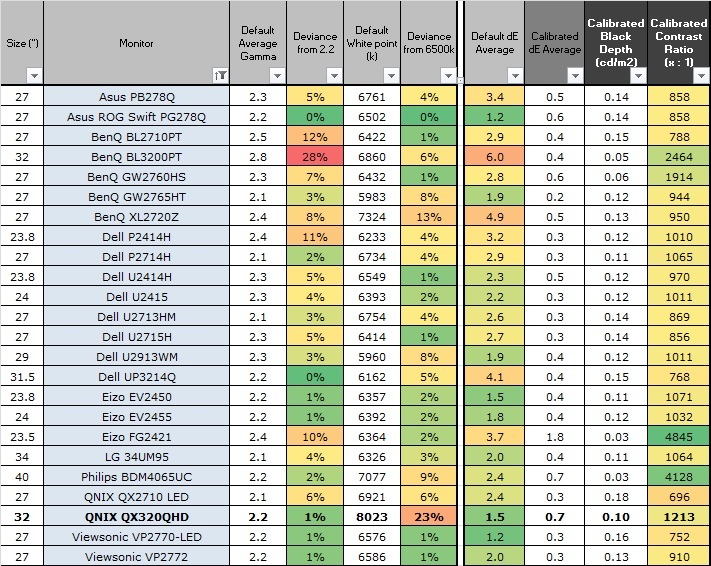 See the relevant section from our BenQ XL2720Z review for more information about that feature. Other manufacturers have more recently followed suit as well since BenQ first introduced it. 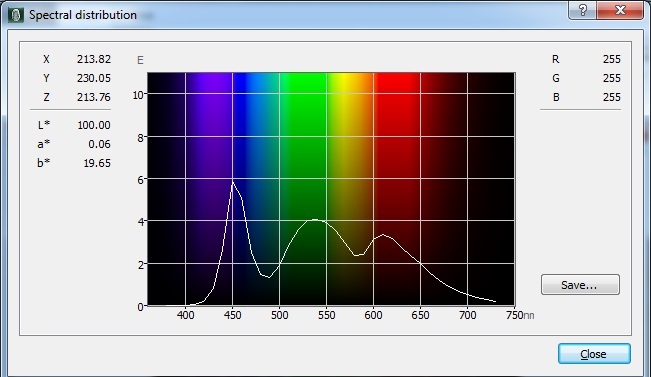 The QNIX QX2710 when we tested it in April 2014 had a Low Blue Light option in the color presets menu but it didn't seem to do anything at all in practice. We were keen to see if this now worked as a feature on the QX320QHD. We measured the spectral distribution of the backlight first of all in the 'normal' colour preset mode, using the X-rite i1 Pro. You can see the high peak for blue light from W-LED backlights here, which is what a Low Blue Light mode is designed to try and reduce. Switching to the Low Blue Light mode setting in the OSD resulted in a pleasing reduction in blue light output as shown above. This worked more effectively than it had on the QX2710, although you are now running with a warmer overall screen appearance as a result. Calibration of the QX320QHD can be tricky as we are lacking any real backlight control. With the brightness setting controlling the digital white level, as you reduce this to a comfortable luminance, you end up crushing the contrast ratio and making the image look bad. We did our best to overcome this and achieve a more comfortable setup as best we could. First of all we changed to the 'user' preset mode which would give us access to the RGB channels, as well as the brightness and contrast settings which are available in all the modes. We left the LaCie software to calibrate to "max" brightness which would just retain the luminance of whatever brightness we'd set the screen to, and would not in any way try and alter the luminance at the graphics card level, which can reduce contrast ratio even further. These adjustments before profiling the screen would help preserve tonal values and limit banding issues. After this we let the software carry out the LUT adjustments and create an ICC profile. Average gamma was measured at 2.2 average, with only a minor 1% deviance as we'd seen out of the box in the 'normal' preset mode. The white point was now corrected to the target, now measured at 6515k, correcting the significant 23% deviance out of the box. Luminance had been improved thanks to the adjustment to the brightness setting and was now being measured at 120 cd/m2. Since this controlled the digital white level it did crush the contrast ratio, leaving us with a black depth of 0.10 cd/m2 but a still reasonable static contrast ratio of 1213:1. Again this was nowhere near the capability of a VA panel like this, but with the digital white level needing to be turned down to achieve a comfortable luminance, this was a necessary sacrifice. Colour accuracy of the resulting profile was very good, with dE average of 0.7 and maximum of 1.9. LaCie would consider colour fidelity to be very good overall. Testing the screen with various colour gradients showed mostly smooth transitions. There was gradation evident in mid to dark tones and some minor banding introduced due to the adjustments to the graphics card LUT from the profilation of the screen. The dark tones were badly affected however because of the way the brightness control operates, losing a large portion of the darker tones into a black mess. This was unfortunately unavoidable if you want to run the screen at a luminance around this level. You can use our settings and try our calibrated ICC profile if you wish, which are available in our ICC profile database. Keep in mind that results will vary from one screen to another and from one computer / graphics card to another. Default setup of the screen out of the box was mostly pretty good. Gamma was within a very minor 1% deviance from the target which was pleasing. Colour accuracy was very good at dE 1.5 average, and contrast ratio was good at 1460:1. This was a high contrast ratio but not as high as you can get from modern VA panels like this, down to the poor brightness adjustment behaviour. The other problem with the default setup was the overly cool white point, measured at 8023k and being 23% out from our target. The luminance was also too high which is standard for most screens. We would normally not have this as an issue, as usually a simple brightness adjustment in the OSD reduces the backlight, lowers the luminance and does not impact any other aspect of the setup. That can't be said for this display though as it adjusts the digital white level, skewing contrast badly and affecting the image quality. The display was pretty good when it came to black depth and contrast ratio compared with IPS and TN Film type displays. With a calibrated contrast ratio of 1213:1 you might consider this to be a high figure. In reality it was very low for a VA panel which is capable of reaching up to around 2500 - 3000:1 as evident by the BenQ BL3200PT (2464:1) which uses the exact same panel. The reason for the crushed contrast ratio was again related to the digital white level adjustment instead of a real backlight control. 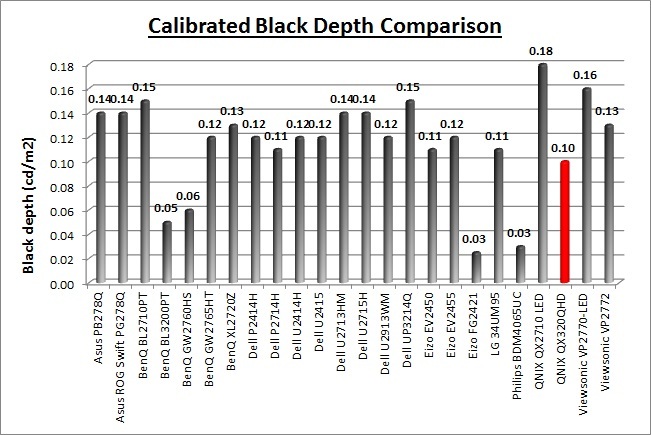 Not to mention that once calibrated to a comfortable luminance level the dark tonal range is severely crushed as well. Viewing angles of the QX320QHD, like the BenQ BL3200PT we'd tested before, were surprisingly good. We had seen some steps forward for VA viewing angles when we reviewed the BenQ GW2760HS with its "Color Shift-Free Technology". This had given a marked improvement over older AMVA panels such as the BenQ GW2750HM which is compared in the review of the GW2760HS linked. The viewing angles of these new 32" AMVA panels are perhaps even a little better still than the GW2760HS. There was less contrast shift horizontally and the wider viewing positions were less pale than on the GW2760HS. They were certainly much better than older AMVA panels which had a tendency to go very pale and also introduce an obvious colour shift. On the older GW2750HM for instance the image went very yellow from a horizontal angle. Vertically there was a slightly more pronounced contrast shift and the image went a little pale, but again not as noticeable as on the GW2760HS and without all the yellow colour shift of the GW2750HM. These improvements were very pleasing, and the BL3200PT was certainly a very good step forward when it comes to viewing angles. They weren't quite as wide as IPS-type panels, but they were certainly getting much closer. Despite these improvements users should still be aware that the panel still exhibits the off-centre contrast shift which is inherent to the VA pixel structure. When viewing a very dark grey font on a black background, the font almost disappears when viewed head on, but gets lighter as you move slightly to the side. This is an extreme case of course as this is a very dark grey tone we are testing with. Lighter greys and other colours will appear a little darker from head on than they will from a side angle, but you may well find you lose some detail as a result. This can be particularly problematic in dark images and where grey tone is important. It is this issue that has led to many graphics professionals and colour enthusiasts choosing IPS panels instead, and the manufacturers have been quick to incorporate this alternative panel technology in their screens. We would like to make a point that for many people this won't be an issue at all, and many may not even notice it. Remember, many people are perfectly happy with their TN Film panels and other VA based screens. Just something to be wary of if you are affected by this issue or are doing colour critical work. On a black image there was a pale purple hue to the screen as you can see above. It wasn't as obvious as the white glow (commonly referred to as IPS-glow) you see from a lot of IPS-type panels, but it was more than any off-angle glow we had seen from the BenQ BL3200PT using the same panel. The luminance uniformity of the screen was a bit of a concern. Our sample showed a noticeable difference in luminance diagonally across the screen from bottom left to top right. In the bottom left hand corner it was a little brighter than the centrally calibrated 120 cd/m2 point, ranging up to 130 cd/m2 in the most extreme example. The top right hand region of the screen was much darker though, dropping down to 91 cd/m2. This could prove problematic if you are working with colour critical content or large areas of a single colour where the variation will become apparent. 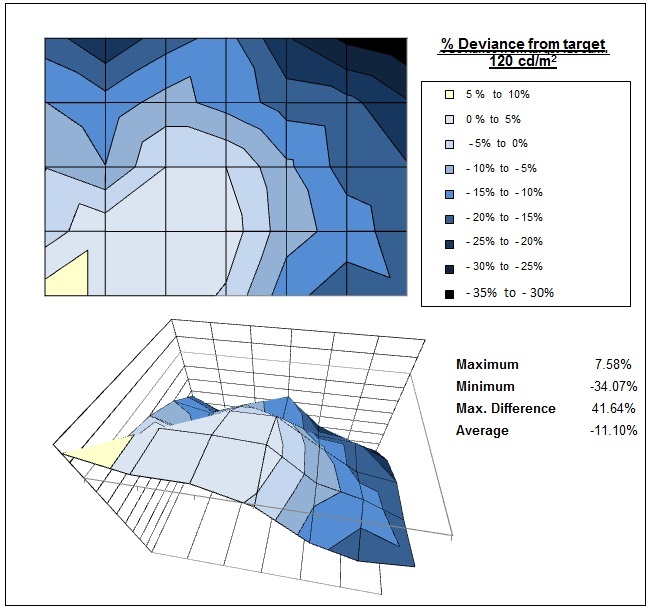 Only 45% of the screen was within a 10% deviance of the target which was pretty poor. Maybe performance will vary by sample. As usual we also tested the screen with an all black image and in a darkened room. A camera was used to capture the result. The camera showed there was some clouding from the four corners of the display. This was fairly subtle in practice to be honest and was nothing too severe. 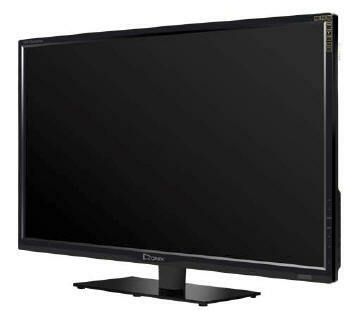 The QX320QHD feature a large 2560 x 1440 WQHD resolution which we've seen for several years from 27" sized monitors. This is part of the new generation of larger 32" sized screens with the same resolution. As a result of the larger 32" screen size you are left with a larger pixel pitch than on a 27" monitor of course, and so text and fonts are bigger. On the QX320QHD the pixel pitch of 0.276 mm is quite a bit bigger than 0.231 mm offered by a 27" monitor of the same res although certainly not too big we didn't feel. In fact it is smaller than on a 27" 1920 x 1080 resolution screen (0.311mm) and is very comparable to a 24" 1920 x 1200 res model (0.270 mm) in pixel pitch. Many people will find this an ideal pixel pitch we think, being more comfortable for a lot of text work without being too small, and without giving up the huge resolution which is great for multi-tasking and split-screen work. The massive resolution is really good for office and general use, giving you a really big screen area to work with. It is a noticeable upgrade from a 24" 1920 x 1200 resolution for multi-tasking and overall desktop area. For those wanting a high resolution for CAD/CAM, design, photo work etc, this is a really good option. The image was very sharp and crisp and text was very clear. With its WQHD display, you enjoy 77% more desktop space than a full HD screen to spread out your windows and palettes. The screen can also support "virtual 4k" resolutions if you have a suitable graphics card and set up a custom resolution to send to the panel (30Hz maximum refresh rate at 3840 x 2160). This seems to be a current trend with some manufacturers so that they can advertise their screen as supporting 4k resolution, but without actually providing a native 4k panel. It's a bit misleading in our opinion and buyers should watch out for it. We tried it on the QX2710 before, and also on the QX320QHD now out of interest but fail to see any real use for it. The high resolution just gets scaled by the panel back down to the 2560 x 1440 pixels which make up the panel. As a result you lose sharpness and clarity and text looks more blurry. Add to this also that you are limited to using a 30Hz refresh rate and it's not a great feature. The light AG coating from the AMVA panel is a positive feature when it comes to these kind of uses and we had been pleased with the coating on this model. This light panel coating ensures that white backgrounds of office documents looked good, and did not suffer from the overly grainy and dirty feel of some competing panels featuring heavy, aggressive AG coating. It also remained free from the reflections you might experience from a full glossy solution so seems to be a good half-way between the two. 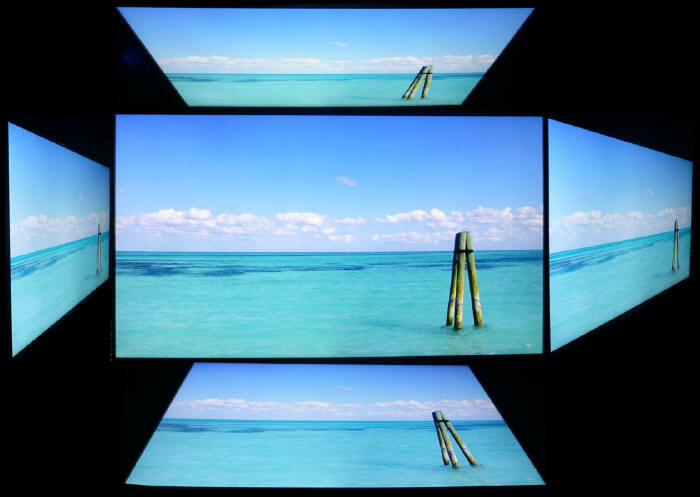 The wide and improved viewing angles provided by the modern AMVA panel in both horizontal and vertical planes, helps minimize on-screen colour shift when viewed from different angles. You do have to contend with the off-centre contrast shift inherent to VA panels which can lead to some detail being lost in darker content when viewed head on. It's not a major problem but it's one of the reasons why IPS is considered a better choice for colour critical work. There are low levels of glow on dark content from an angle, certainly nothing like you see on most IPS panels although it was more apparent than on the similar BenQ BL3200PT for some reason. The sheer size of the screen may create some minor issues with glow visibility towards the corners depending on your viewing position and line of sight. The default setup of the screen was decent enough, offering a good gamma and low dE. The white point was a bit too cool and the screen was far too bright. The major problem with this screen is the lack of a true backlight adjustment, and so (as we've talked about lots already), achieving a comfortable luminance comes at a big cost. The Low Blue Light mode may be useful to some users who are sensitive to the blue spectral output from the W-LED backlight unit. It at least did reduce the blue spectral output but again you've still got problems with the luminance and contrast ratio. The brightness range of the screen was good, with the ability to offer a luminance between approximately 264 and 82 cd/m2. This should mean the screen is perfectly useable in a wide variety of ambient light conditions, including darkened rooms. A setting of ~25 in the OSD brightness control should return you a luminance close to 120 cd/m2. The backlight regulation is the main issue. There's no PWM used which at least means the screen is flicker free, but the fact that the backlight is not adjusted is a major drawback. The stand provided on this particular model we are testing is very limited as well, with only a basic side to side swivel offered. There's not even a tilt adjustment here and so the screen is too vertical for our liking. In fact we had to wedge some cardboard underneath the front of the stand to tilt the screen back a bit for our uses! Look for the other versions of the QX320QHD if you can as the lack of stand adjustments on this model is annoying. Wall or arm-mounting the screen is an option of course as the screen is at least VESA compliant (200 x 100mm). The additional integrated speakers might be useful for the odd Youtube clip or mp3. There's unfortunately no USB ports or any further extras like ambient light sensors or card readers which are useful in office environments. The screen is designed to run at its native resolution of 2560 x 1440 and at a 60Hz recommended refresh rate. However, if you want you are able to run the screen outside of this resolution. We tested the screen at a lower 1920 x 1080 resolution to see how the screen handles the interpolation of the resolution, while maintaining the same aspect ratio of 16:9. At native resolution the text was sharp and a comfortable size as we've already discussed. When running at a 1080p resolution the text is still sharp, with low levels of blurring. You do lose some screen real-estate as well of course but the image seems to be interpolated well from 1080p sources. The QX320QHD is rated by QNIX as having a 5ms G2G response time which suggests that the panel should be using overdrive / response time compensation (RTC) technology to boost pixel transitions across grey to grey changes. There is no user control over the overdrive impulse within the OSD menu so we will have to rely on the manufacturers setup here. The part being used is the AU Optronics M320DVN01.0 AMVA panel. Have a read about response time in our specs section if you need additional information about this measurement. It appears that the screen does not use overdrive at all! 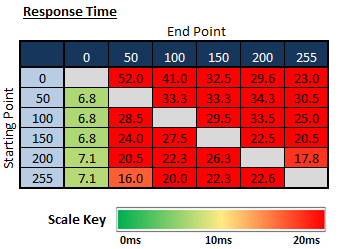 The average G2G response time was measured at 24.1ms which was very slow for any modern panel. VA panels have never been known for their responsiveness, and to use one without any overdrive circuit is asking for trouble. The only "normal" speed transitions were those changing to black (x > 0) where they reached down to 6.8 - 7.1ms. The rest of the transitions from grey to grey shades were very slow indeed. The rise times particularly were slow, with some reaching as high as 52ms in the worst cases. It looks like QNIX haven't used an overdrive circuit on this model at all. We know from our tests of the BenQ BL3200PT which uses the same panel, that it is capable of faster pixel response times when overdrive is properly applied. A few slow transitions plagued that screen as well but it was much faster than the QX320QHD. Clearly the 5ms G2G response time spec is misleading here. 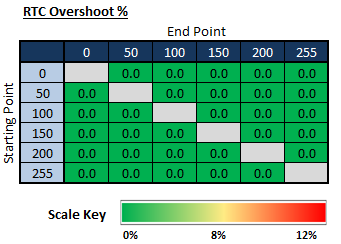 On a positive note, because no overdrive was being used there was no overshoot at all. The above graph gives an example of the slowest pixel response time we measured, on the rise time here from 0 - 50. This was measured at a whopping 52ms to reach 90% of the desired final luminance. The above is a more classic example of what we saw. 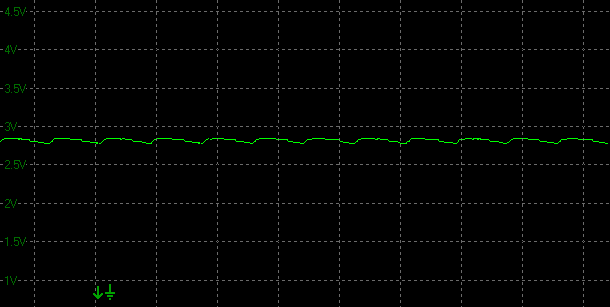 Slow rise times (33.3ms here) and slow fall times (28.5ms). No overshoot at all, because it seems overdrive is not even been applied. The response time performance of the QNIX QX320QHD was very poor unfortunately. 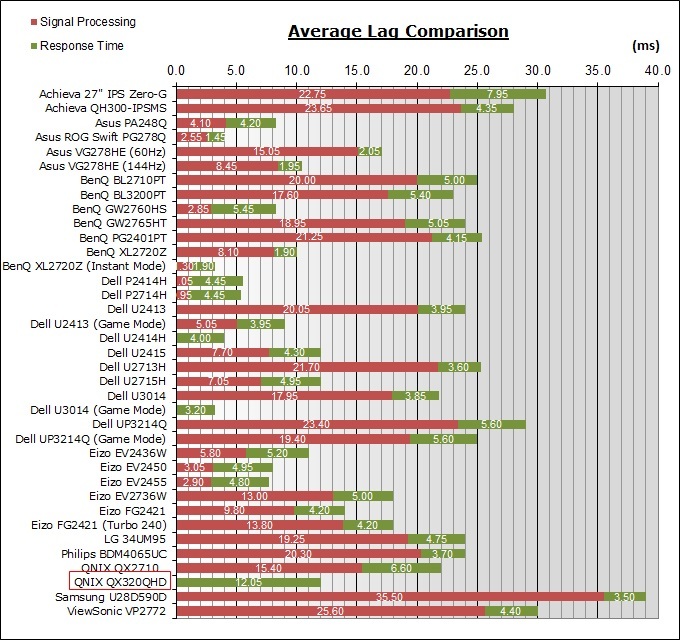 With an average G2G response time figure of 24.1ms it was slower than any other panel we've tested. It's a VA panel type, which are inherently slow anyway and really need a decent amount of overdrive applied to be able to reach satisfactory speeds for gaming. Unfortunately with overdrive being left off this screen, the pixel transitions were slow. We have seen much faster from other modern VA panels like the BenQ BL3200PT (same panel - 10.8ms G2G average) and BenQ GW2760HS (10.9ms) for instance. IPS panels can reach a little faster still, getting to around 8.6ms G2G in the best cases without introducing a lot of overshoot problems from an overly aggressive RTC impulse. 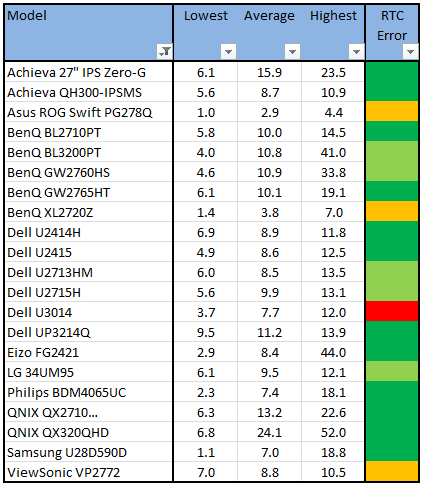 TN Film models are of course faster still, reaching down to 2.9ms for instance in the example of the new Asus ROG Swift PG278Q (with moderate overshoot). As a result, we wouldn't recommend this screen for gaming to be honest, unless it's perhaps low motion games which won't suffer as a result of the slow response times too much. In practice the QNIX QX320QHD showed high levels of motion blur and some ghosting due to its slow response times. There was no user control for the overdrive impulse and so there was no way to speed the panel up either unfortunately. If we compare the QX320QHD first of all against two other recent VA panels we've tested, the difference in responsiveness is quite obvious. There is far more blurring and some ghosting to the image from the QNIX than the other two models, and we know from our oscilloscope measurements that they have a healthy application of overdrive to boost pixel response times nicely. Comparing the QX320QHD against their 27" QX2710 model is also possible. The QX2710 features an AHVA (IPS-type) panel and although it's quite slow for that technology compared with other models on the market, it's still quite considerably faster than the AMVA panel (VA type) in the 32" model here. We can also compare the QX320QHD to some popular 27" 2560 x 1440 IPS-type screens we have tested in recent times. All these other models are again much faster than the QNIX in practice, showing sharper moving images with less blurring. One are which some Korean monitors are known for are their ability to overclock the refresh rate. In affect this would allow you to boost the native 60Hz maximum refresh rate supported by the panel to 100Hz or more. The ability to overclock a monitor depends on several factors including the panel, internal electronics and your graphics card. You will need third party apps to set up a custom resolution and refresh rate to test it, and results will vary from one screen to another often. Some Korean monitors can be overclocked up to around 100Hz which then brings about benefits in terms of frame rate and motion smoothness for gaming. It also means you can have a 2560 x 1440 resolution IPS (or PLS/AHVA) panel with a refresh rate of >60Hz which is desirable to some. It won't be long before we see some native 120Hz+ IPS-type displays on the market anyway. 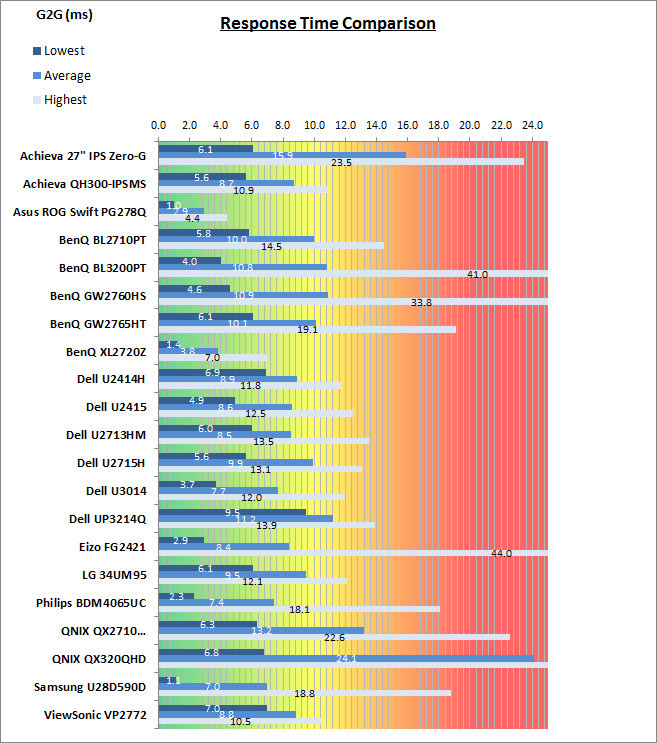 There are a couple of considerations which should be made when even thinking about overclocking. Firstly you need to consider whether the response time of the panel is even sufficient to cope with the increased frame rate. For instance if you are running a screen at 120Hz, there is a new frame sent to the screen every 8.33ms. If the response time is not less than this it will not be able to keep up with the demand. This is one of the reasons why TN Film panels are the main technology for 120Hz+ displays as their response times allow for this frame rate support. Most IPS-type panels are much slower and so while you might be able to send 120 fps to the screen (if you can reach 120Hz), the response time of the pixels may struggle to keep up. This results in excessive blurring and a poor gaming experience. You need to have pixel response times which are at least able to keep up with the frame rate ideally. There are still benefits in terms of gaming frame rate and smoothness of movement but refresh rate isn't everything. You also need to be aware that although you might be able to run a screen at a higher refresh rate, and it will display an image, it may well drop frames which makes the whole thing pointless anyway. That will lead to stuttering and frame drops which no one wants. What you are looking for is a display with a fast response time, and the ability to support higher refresh rates without frames being dropped. This screen is advertised as being able to support overclocked refresh rates although a specific figure isn't listed. We tested the QX320QHD and it was easy enough to create custom resolutions and refresh rates which the monitor accepted. An image was displayed fine at 2560 x 1440 resolution and at 75 and 100 refresh rates. We tested these over both DL-DVI and DisplayPort. At 75Hz the image was displayed fine and we confirmed no frames were dropped. 75Hz is a viable overclocking refresh rate on this screen. 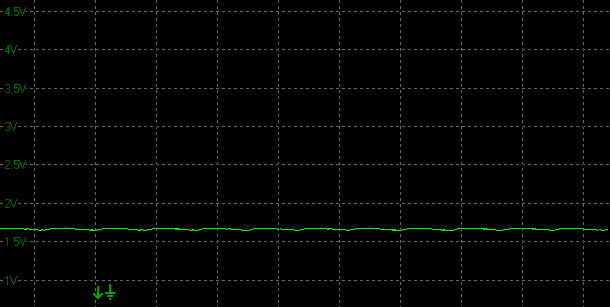 At 100Hz although the image was displayed, frames were unfortunately dropped, meaning running at 100Hz was pointless. Some artefacts were also visible in some situations. We didn't bother trying other custom refresh rates between 75Hz and 100Hz as the response times were too slow anyway to keep up with the frame rate demands on this screen, even if you send 60 fps to the screen. Aspect Ratio Control - The QX320QHD has a very limited range of aspect ratio control options through the OSD 'Misc' menu. There are only options for "wide" and "4:3" only. At least with the screen being a native 16:9 aspect ratio it should handle a lot of content and external devices without much issue, as a lot of content is in the same aspect ratio nowadays anyway. Would have been nice to see more options available though like an auto-aspect retention, 5:4 and 1:1 pixel mapping perhaps. Preset Modes - There is a specific gaming preset modes available in the OSD on this model. We're not really sure what it's intended to do, but it seems to make the image a little warmer and alter the sharpness a little, compared with our calibrated normal mode. The screen showed a total average display lag of 7.8 ms as measured with SMTT 2. Taking into account half the average G2G response time at should be 12.05ms we can estimate that there is basically no signal processing lag on this screen at all. This should not present any problems for gaming, even playing fast FPS games, although the response times are of course a concern. 32" screen size makes it a good option for an all-in-one multimedia screen, but being quite a bit smaller than most modern LCD TV's of course. DVI, DisplayPort and HDMI connections available, offering great connectivity choices for modern DVD players, Blu-ray, consoles etc. Cables provided in the box for DVI only. 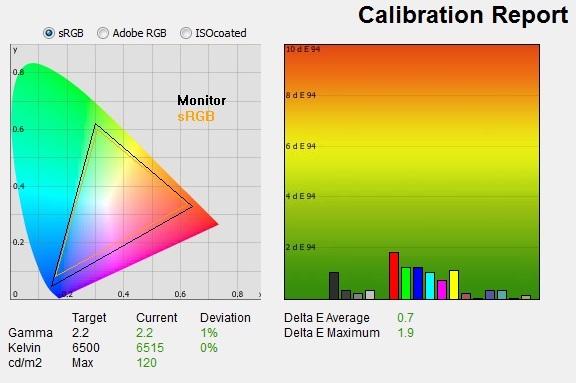 Wide brightness range adjustment possible from the display, including high maximum luminance of ~264 cd/m2 and a good minimum luminance of ~82 cd/m2. This should afford you very good control for different lighting conditions. 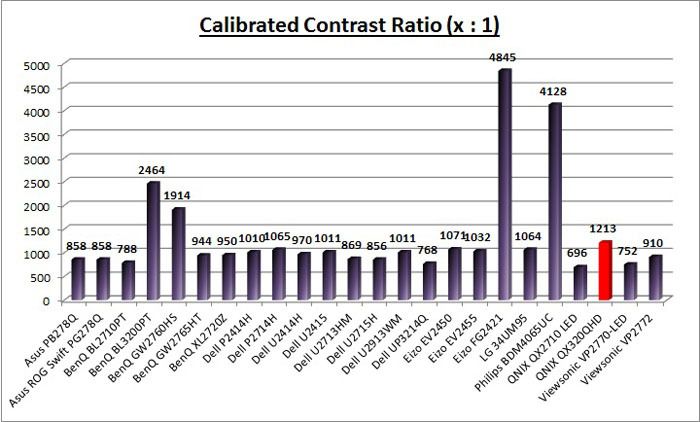 Contrast ratio is the problem though as it varies massively across the brightness adjustment range. The brightness control changes the digital white level and not the backlight intensity, and so you massively crush contrast ratio when you alter away from a high setting of around 70%. As a result, running the screen at a more comfortable lower luminance results in a significantly reduced contrast ratio and a loss of a huge amount of detail in the darker tonal range. This is not a good option for movie viewing as a result. There is no specific 'movie' preset mode available on this screen. Poor pixel responsiveness which may struggle with fast moving scenes in movies and lead to noticeable blurring and ghosting. Wide and improved viewing angles from modern AMVA panel technology meaning several people could view the screen at once comfortable and from a whole host of different angles. White glow from an angle on black content is minimal. No major backlight leakage which is good, even in darkened room conditions. Some clouding from the corners evident. Very limited range of ergonomic adjustments on this particular version we are testing making it hard to obtain a comfortable position for multiple users or if you want to sit further away from the screen for movie viewing. 2x 5W integrated stereo speakers on this model and a headphone jack if sending sound to the screen over HDMI. Limited range of hardware aspect ratio options available with only 'wide' and '4:3' offered. Being a native 16:9 aspect ratio screen this might not be a big problem as lot of content is in that format anyway. I think before we summarise the screens performance we should point out that Korean import models like this have one primary focus - offering decent panels at a very competitive and low cost. You can pick up the QX320QHD for ~£290 GBP, which is a lot less than mainstream competitors like the BenQ BL3200PT which uses the same panel (£480 GBP). Of course you do have to sacrifice a fair amount for the cost saving. Unfortunately while some areas of the screen were reasonably good, there were a few main issues which we found it hard to look past. The lack of a proper backlight adjustment from the brightness control was a real problem and goodness knows why any manufacturer would use this method nowadays. True, it allows them to provide a flicker free backlight (as advertised), but what is the point when adjusting the luminance of the display (which you really have to) results in crushed contrast ratios, messed up images and loss of darker tonal values? 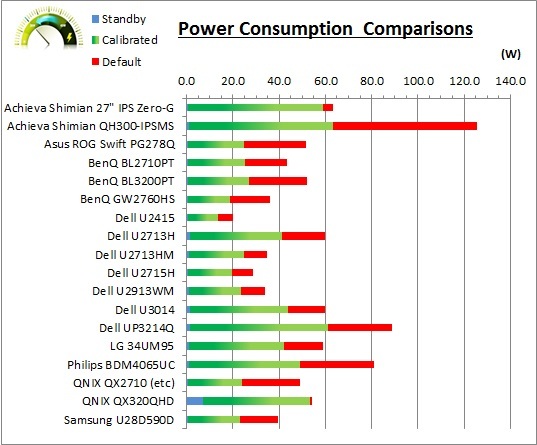 Not to mention the high power consumption as a result of having a backlight running at maximum power all the time. This really was a glaring issue we felt, and it had a negative impact on a lot of areas of the screen. It's not the first screen we've seen like this, and to be honest it seems a fair number of Korean models use this method. Just know what you're buying if you do want to go after a low cost screen. Brightness control aside, we were also disappointed by the very poor pixel response times. It seems no overdrive circuit has been used at all here, and response times are very slow as a result. It's a shame, as the non-existent signal processing lag and overclockable refresh rate (at least up to 75Hz) were positive points, and could have made this a decent gaming option. Both were pretty pointless when the pixel response times make gaming a non-starter. The stand on this particular version was also very limited and so we would encourage any potential buyer to go for one of the "pivot" models or mount the screen separately if you do decide to purchase the QX320QHD.